HOWLING POINT CHRISTMAS 2013 from Chuck Hartley on Vimeo. Chuck posted this on Monday, December 9, 2013 at 5:50 pm. Make the second comment. 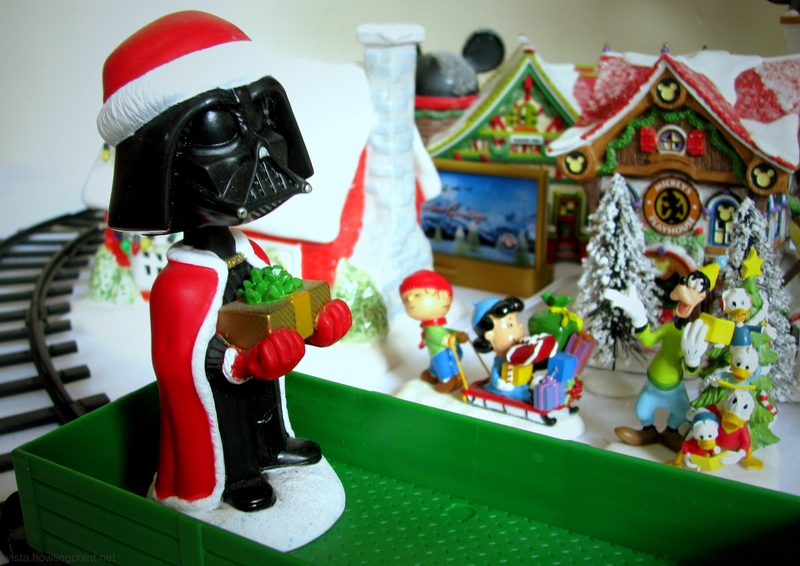 Just a reminder that Darth Santa is out and about making his annual naughty and not naughty enough list. Let’s see…missed Halloween, the election and Thanksgiving here. Blame Twitter and Facebook (via iPhone) and a dead PC. Fortunately the Christmas banners went up automatically on the first,so the site didn’t look completely neglected. Reloading software and setting new defaults on a new HP laptop now, and trying not to get thrown over the rails managing the Windows 8 learning curve. Not to mention playing with my new train and scheduling photo ops for the Dark Lord of the Snow. 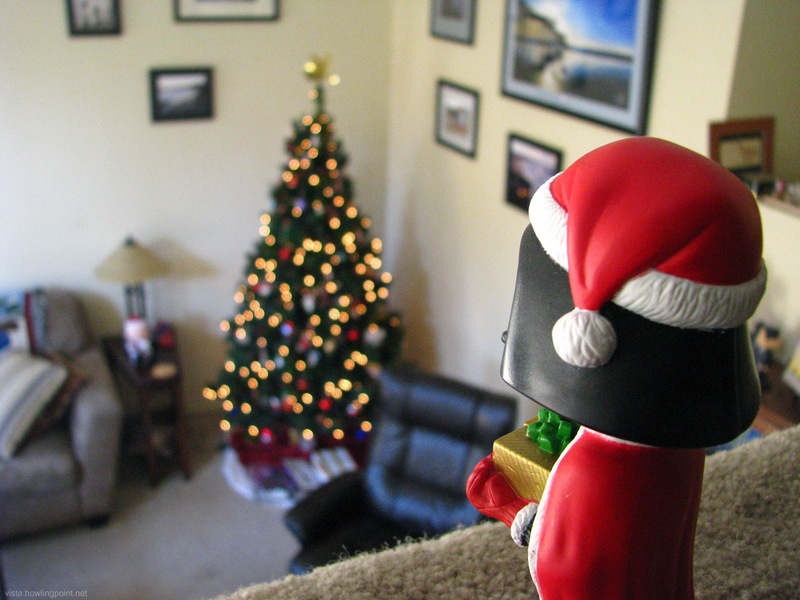 The 2010 holidays kinda fizzled around here. We were in escrow on the new place and never really committed to decorating, and didn’t want to unpack a lot of decorations we’d only have to pack up again a couple weeks later (the escrow was originally scheduled to close on Christmas Eve). Having a blast decorating the new house though, and out of frustration with work, and just a bit of idlehandedness, I’ve turned to the dark side for Howling Point’s host of the new decor. 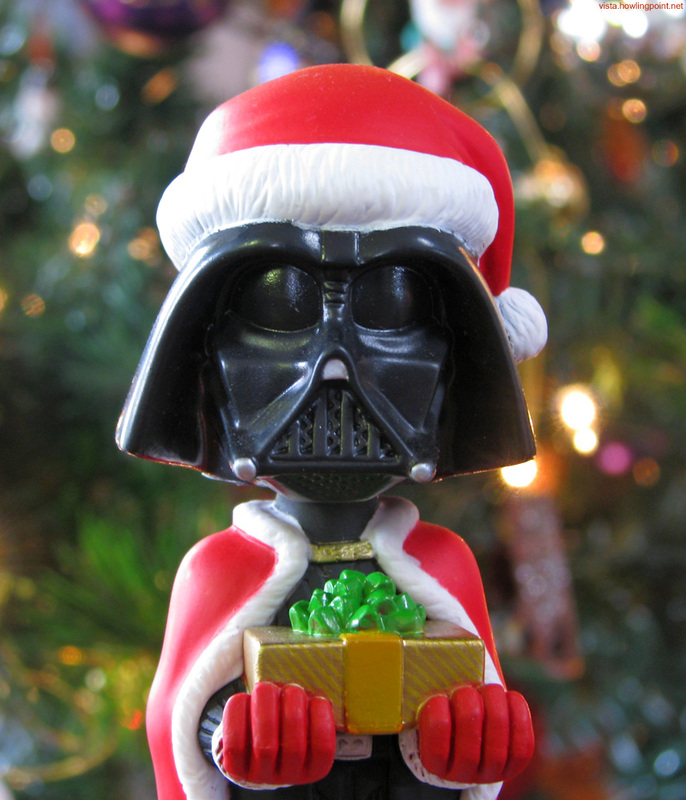 Our revered and beloved Darth Santa bobble debuted here in 2009, having been adopted in Vegas earlier that year. He’s back now, making certain everything is fully operational for the arrival of the Man in Red later this month. More documentation of his efforts (prequels, sequels, and maybe even an animated Life Day special), not to mention 3-D remasterings scheduled for 2020, will be forthcoming. 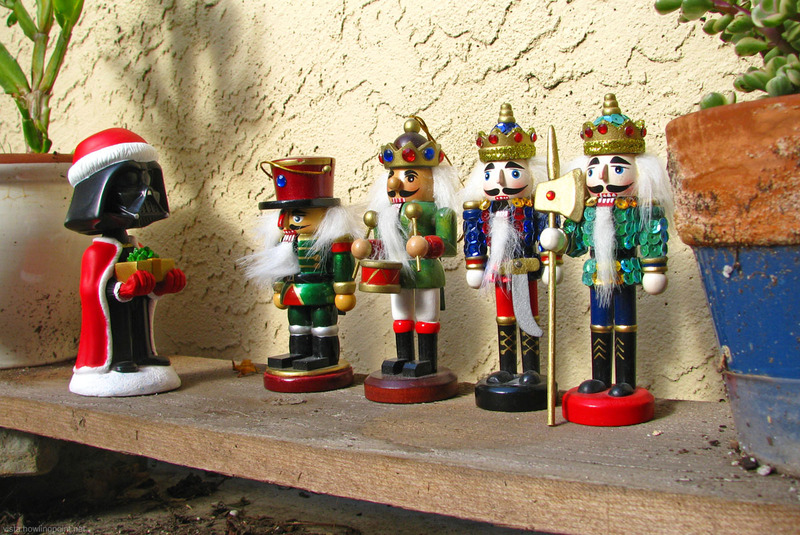 Taking a break from the last-minute flurry of holiday baking to bring you a little non-traditional Christmas music. Yeah, I know some of you a freezing your bits off under tons of snow that are collapsing your buildings. Not really my problem, but I do have other issues that I need to take my mind off of, so here’s a bit of Christmas eye candy for ya [via Kenneth in the 212]. Remember, Christmas is only for bundling up if you’re in badly stereotyped movies. Otherwise the secular aspects of the holiday season are all about Speedo Santa Runs and prepping for the Penguin Plunge.